Labor Day is the day we celebrate the process our mothers went through in order to deliver us at birth. Sorry, wrong holiday. Labor Day in the U.S. is the day we celebrate the achievements of the American labor movement. 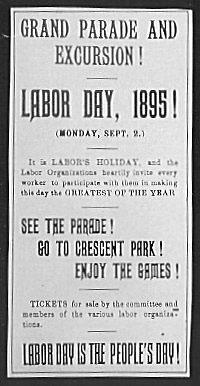 While it is still disputed whether the holiday was first proposed by Peter J. McGuire, the leader of the Brotherhood of Carpenters, or Matthew Maguire, a machinist — observances of the holiday go back over a century. In other countries, it’s often celebrated as International Workers’ Day on May Day. Though Oregon was the first state to make it an official public holiday in the U.S., it became a federal holiday in 1894 at which time 30 states celebrated it. Now, all American states recognize it as a federal holiday. In the U.S. it is considered the unofficial end of summer, being a three-day weekend ahead of the school term in some parts of the country. In days of old all school began then, and football. Now, school often starts in August and football seems to run all year long, with occasional interruptions by baseball. Work has dignity. It is not a curse. In the Biblical account, God worked 6 days in Creation and rested the 7th from his labors. Even in the Garden, man was given the work of cultivating and caring for the earth. online. I’m going to recommend this website!